Adapted from: Julia Tucker De Sanctis , MD , Am Fam Physician 2001;64:1965-1972. Peripheral vascular disease of the lower extremities is an important cause of morbidity that affects up to 10 million people in the United States.More than 70 percent of patients diagnosed with the disease remain stable or improve with conservative management. Those who do not improve may undergo contrast angiography or magnetic resonance angiography, which may be used in planning for surgery or percutaneous intervention. Surgical bypass is the gold standard for extensive vascular occlusive disease, but endovascular interventions, including percutaneous transluminal angioplasty and stent placement, are being used more frequently, particularly in patients with significant comorbid conditions. Intermittent claudication (pain while walking that abates during rest) is the most common symptom. Other symptoms include numbness or weakness in the legs, aching pain in the feet or toes while at rest, nonhealing ulcers on the leg or foot, cold legs or feet, and skin color changes of the legs or feet (particularly dependent rubor). Some patients, however, are asymptomatic. Nearly one in four people screened annually through the Legs for Life program are determined to be at moderate to high risk of lower extremity peripheral vascular disease. In most cases, the presence of PVD is a sign of systemic atherosclerosis, which puts these patients at high risk of stroke, myocardial infarction, and cardiovascular death. Risk factors for PVD include smoking, hypertension, hyperlipidemia, diabetes, family history of cardiac or vascular disease, obesity, and sedentary lifestyle. Although a careful history and physical examination are the first steps to the diagnosis of PVD, they should not be relied on solely. One of the most useful objective parameters to assess lower extremity arterial perfusion is the ankle brachial index (ABI), a test that can be performed in the physician's office. This study screens for hemodynamically significant disease and helps define its severity. One of the most useful tests to assess lower extremity arterial perfusion is the ankle brachial index. The patient is placed in a supine position and brachial and ankle systolic pressures are obtained.The protocol involves taking routine bilateral upper extremity pressure readings. The higher of the systolic pressures is used to calculate the ABI. (A lower arm pressure may indicate PVD of that arm.) Next, the cuff is placed on the lower right calf. The Doppler (usually required because ankle blood pressure may be inaudible with a stethoscope) is placed behind the medial malleolus to obtain the posterior tibial (PT) systolic pressure and then placed on the top of the foot to obtain the dorsalis pedis (DP) systolic pressure. The ABI is calculated by dividing the highest ankle systolic pressure (DP or PT) by the highest systolic pressure from either arm . The process is then repeated on the left ankle. ABIs less than 1.0 are abnormal. The majority of patients with claudication have ABIs ranging from 0.30 to 0.90. Pain at rest or severe occlusive disease typically occur with an ABI less than 0.50. Indexes less than 0.20 are associated with ischemic or gangrenous extremities. In diabetic patients with heavily calcified vessels, the arteries are frequently noncompressible. This results in an artifactually elevated ankle pressure, which can cause underestimation of disease severity. In these patients, toe pressure determinations more accurately reflect perfusion. 3 Noninvasive measures such as pulse volume recording ( PVR ), duplex ultrasound scanning and exercise testing can be used to confirm the existence of vascular occlusive disease. 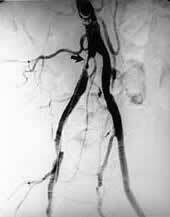 Standard angiography and magnetic resonance angiography (MRA) can provide anatomic definition of the occlusive disease. 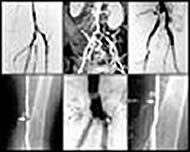 Whether to use MRA or angiography depends on several conditions, including certain patient factors, availability, and physician preference. MRA is one fourth as expensive as angiography, is noninvasive, and uses no ionizing radiation or contrast dye (Figure 1). MRA can be beneficial in preoperative planning of lower extremity surgical revascularization. However, it can be challenging to interpret, because it is more susceptible to confounding artifacts such as patient motion, surgical clips, indwelling stents, and prostheses. Additionally, MRA is contraindicated in patients who have pacemakers and orbital metallic foreign bodies. In patients who may require angioplasty as a first-line treatment, angiography offers the possibility of diagnosis and treatment during a single procedure. FIGURE 1 . Abdominal magnetic resonance angiography. Distal abdominal aortic and bilateral common iliac artery occlusions appear as signal voids (arrows denote left common iliac occlusion) . The tortuous vessel that courses over the area of right common iliac signal void is an enlarged inferior mesenteric artery, a collateral pathway supplying the external iliac artery via the internal iliac artery. Conservative treatment options, including cessation of tobacco use, exercise programs, and modifications in lipoprotein and cholesterol abnormalities, are the first line of defense against PVD. Table 1 compares the use of angioplasty with bypass surgery in the treatment of PVD. Surgical bypass of severely occluded vessels has been considered the gold standard for use in symptomatic patients who do not respond to more conservative treatments . PVD = peripheral vascular disease. NOTE: Patients who have had their saphenous veins harvested for coronary artery bypass may be better candidates for percutaneous transluminal angioplasty than for synthetic bypass grafting, depending on the lesion and location. 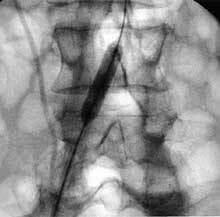 For purposes of revascularization, PVD is considered in terms of inflow (aortoiliac) and outflow (infrainguinal) occlusive disease. In both cases, surgical revascularization represents the gold standard against which the results of percutaneous revascularization with angioplasty and stents are compared. Increasingly, combined surgical bypass and percutaneous endovascular treatment by the vascular/interventional radiologist, vascular surgeon, or interventional cardiologist are being used to optimize patient outcome while minimizing morbidity. The iliac arteries are technically among the easiest vessels to approach percutaneously and are the largest peripheral lower extremity vessels with the highest flow rates. These factors optimize the outcome of percutaneous transluminal angioplasty (PTA) and stenting (Table 2). Surgical bypass has a durable high rate of patency, reported as 93 percent at 42 months in a recent study, 8 but it is a major surgical procedure with potential for systemic complications in patients with preexisting significant comorbid conditions. Before the first report of metallic stent deployment in peripheral arteries of humans in the late 1980s, angioplasty was the only means of percutaneous revascularization. A meta-analysis 9 of six PTA studies (1,300 patients) has established the high technical success of PTA for aortoiliac occlusive disease, with a combined immediate technical success for stenoses and occlusions of 91 percent. In a quality-of-life study 11 of patients treated with PTA for iliac artery occlusive disease, walking distance improved by 20 percent 24 months after PTA. Physical functioning also improved, along with a significant decrease in pain. FIGURE 2. Digital subtraction pelvic arteriogram. (Left) There is a severe stenosis of the right common iliac artery (arrow) . (Center) Image hold. Deployment of a Palmaz stent mounted on an angioplasty balloon, seen in its fully expanded state. (Right) Magnification digital subtraction arteriogram centered at the aortic bifurcation. 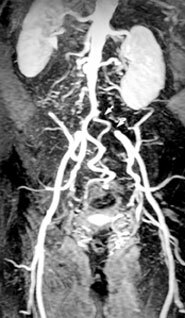 Following stenting, the right common iliac artery is widely patent. In a quality-of-life study 11 of patients treated with primary stent placement for iliac artery occlusive disease, walking distance improved by 26 percent 24 months after treatment. Also, physical functioning improved and pain decreased. The Veterans Administration Cooperative Study Group 14 found that, in a group of patients with claudication randomized to bypass surgery or angioplasty, no significant outcome difference was found at four years, but the early mortality rate was better with angioplasty. Angioplasty failure did not preclude performing subsequent bypass grafting or increase the rate of limb loss. 14 In a Swedish study 15 comparing angioplasty with surgery, significantly shortened length of hospital stay was found in patients undergoing angioplasty for claudication or chronic limb ischemia, compared with a surgery group. Similar success and complication rates were found at one year.15 In a recent literature review and multivariate sensitivity analysis 16 evaluating quality adjusted life years as the main effectiveness measure, a Dutch-American study group favored angioplasty as the first-line treatment modality for claudication. The role of infrainguinal angioplasty and stenting in the treatment of lower-extremity ischemia is more controversial than PTA and stenting for aortoiliac occlusive disease. Because of the small size of the infrainguinal vessels above and below the knee, dissections are more likely to be flow-limiting, spasm is more common, and relatively mild intimal hyperplasia or recoil of treated lesions may lead to recurrence of clinical symptoms. In contrast, infrainguinal surgical bypass carries a lower rate of morbidity than iliac bypass and retains a high patency rate. 17 Although percutaneous revascularization plays a less prominent role in the infrainguinal vasculature than in the aortoiliac system, it remains attractive as a minimally invasive alternative to surgical bypass, requiring shorter hospital stays and permitting faster recovery. FIGURE 3. 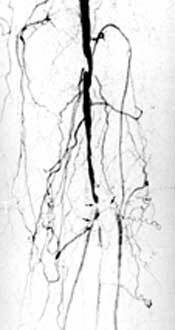 Lower extremity arteriogram at the level of the distal thigh. (Left) There is mild diffuse superficial femoral artery disease with a focal severe stenosis at the adductor canal (arrow) . 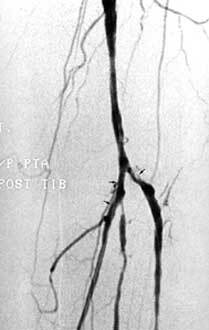 (Right) Lower extremity arteriogram with magnification at the level of the distal thigh following percutaneous transluminal angioplasty with a 6 mm balloon. The angiographic appearance is significantly improved, with only mild residual stenosis (arrow). Significantly higher patency rates have been achieved in patients with claudication when compared with those with critical ischemia. 18,19 In one study 20 of patients with femoropopliteal stenoses, successful PTA was reported in 16 to 53 percent of patients at five years, depending on the extent of disease. In another study 16 comparing surgical with endovascular treatment for 65-year-old men with disabling claudication or chronic critical ischemia and femoropopliteal stenosis or occlusion, PTA increased quality-adjusted life expectancy by two to 13 months and resulted in decreased lifetime expenditures, compared with surgery. This same study used a decision analysis of cost and outcomes to evaluate six strategies for approaching infrainguinal occlusive disease in patients with claudication and with limb-threatening ischemia, including surgery, PTA, or both. In all patients, PTA was the best initial strategy, except in patients with femoropopliteal occlusion rather than stenosis who also had critical ischemia. For those patients, surgery was the best initial strategy. FIGURE 4. Digital subtraction arteriogram at the level of the calf. (Left) Arrows delineate segmental occlusion of the anterior tibial artery and severe focal stenoses of the tibioperoneal trunk and posterior tibial artery. (Right) Digital subtraction arteriogram at the level of the calf following angioplasty for limb salvage. The anterior tibial artery occlusion has been recannalized and the tibioperoneal trunk and posterior tibial artery stenoses dilated, yielding a markedly improved angiographic appearance at each location (arrows) . Weitz JI, Byrne J, Clagett GP, Farkouh ME, Porter JM, Sackett DL, et al. Diagnosis and treatment of chronic arterial insufficiency of the lower extremities: a critical review. Circulation 1996;94:3026-49. Becker GJ, McClenny TE, Kovacs ME, et al. The importance of increasing public and physician awareness of peripheral arterial disease. J Vasc Interv Radiol 2001, (in press). Castañeda-Zuñiga WR, Tadavarthy SM. Interventional radiology. 2nd ed. Baltimore : Williams & Wilkins, 1992. Dawson DL, Cutler BS, Hiatt WR, Hobson RW 2d, Martin JD, Bortey EB, et al. A comparison of cilostazol and pentoxifylline for treating intermittent claudication. Am J Med 2000;109:523-30. U.S. Dept. of Health and Human Services, Food and Drug Administration. FDA approves new treatment for painful leg disorder. FDA talk paper T99-04, January 15, 1999. Retrieved September 2001, from: http://www.fda.gov/bbs/topics/ANSWERS/ ANS00935.html. Physicians' desk reference. 54th ed. Montvale , NJ : Medical Economics Company, 2000. Whiteley MS, Ray-Chaudhuri SB, Galland RB. Changing patterns in aortoiliac reconstruction: a 7-year audit. Br J Surg 1996;83:1367-9. Ballard JL, Bergan JJ, Singh P, Yonemoto H, Killeen JD. Aortoiliac stent deployment versus surgical reconstruction: analysis of outcome and cost. J Vasc Surg 1998;28:94-103. Bosch JL, Hunink MG. Meta-analysis of the results of percutaneous transluminal angioplasty and stent placement for aortoiliac occlusive disease. Radiology 1997;204:87-96. Johnston KW. Factors that influence the outcome of aortoiliac and femoropopliteal percutaneous transluminal angioplasty. Surg Clin North Am 1992;72:843-50. Bosch JL, van der Graaf Y, Hunink MG. Health-related quality of life after angioplasty and stent placement in patients with iliac artery occlusive disease: results of a randomized controlled clinical trial. The Dutch Iliac Stent Trial Study Group. Circulation 1999;99:3155-60. Cikrit DF, Gustafson PA, Dalsing MC, Harris VJ, Lalka SG, Sawchuk AP, et al. Long-term follow-up of the Palmaz stent for iliac occlusive disease. Surgery 1995;118:608-14. Houston JG, McCollum PT, Stonebridge PA, Raza Z, Shaw JW. Aortic bifurcation reconstruction: use of the Memotherm self-expanding nitinol stent for stenoses and occlusions. Cardiovasc Intervent Radiol 1999;22:89-95. Wilson SE, Wolf GL, Cross AP. Percutaneous transluminal angioplasty versus operation for peripheral arteriosclerosis. Report of a prospective randomized trial in a selected group of patients. J Vasc Surg 1989;9:1-9. Holm J, Arfvidsson B, Jivegard L, Lundgren F, Lundholm K, Schersten T, et al. Chronic lower limb ischaemia. A prospective randomised controlled study comparing the 1-year results of vascular surgery and percutaneous transluminal angioplasty (PTA). Eur J Vasc Surg 1991;5:517-22. Hunink MG, Wong JB, Donaldson MC, Meyerovitz MF, de Vries J, Harrington DP. Revascularization for femoropopliteal disease. A decision and cost-effectiveness analysis. JAMA 1995;274:165-71. Treiman GS, Ichikawa L, Treiman RL, Cohen JL, Cossman DV, Wagner WH, et al. Treatment of recurrent femoral or popliteal artery stenosis after percutaneous transluminal angioplasty. J Vasc Surg 1994;20:577-87. Hunink MG, Donaldson MC, Meyerovitz MF, Polak JF, Whittemore AD, Kandarpa K, et al. Risks and benefits of femoropopliteal percutaneous balloon angioplasty. J Vasc Surg 1993;17:183-94. Stanley B, Teague B, Raptis S, Taylor DJ, Berce M. Efficacy of balloon angioplasty of the superficial femoral artery and popliteal artery in the relief of leg ischemia. J Vasc Surg 1996;23:679-85. Martin DR , Katz SG, Kohl RD , Qian D. Percutaneous transluminal angioplasty of infrainguinal vessels. Ann Vasc Surg 1999;13:184-7. Gray BH, Sullivan TM, Childs MB, Young JR, Olin JW. 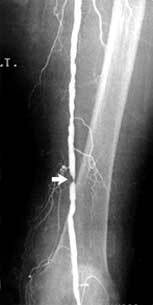 High incidence of restenosis/reocclusion of stents in the percutaneous treatment of long-segment superficial femoral artery disease after suboptimal angioplasty. J Vasc Surg 1997;25:74-83. Lofberg AM, Lorelius LE, Karacagil S, Westman B, Almgren B, Berqgvist D. The use of below-knee percutaneous transluminal angioplasty in arterial occlusive disease causing chronic critical limb ischemia. Cardiovasc Intervent Radiol 1996;19: 317-22.